SAAT Counselling 2017(शिक्षा ‘ओ’ अनुसन्धान विश्वविद्यालय काउंसलिंग) is going to be conducted tentatively in the month of June 2017 by Siksha ‘O’ Anusandhan University. The SAAT admission 2017 is going to be conducted for the candidates who have successfully qualified SAAT 2017 entrance test or JEE Main 2017. Therefore qualified candidates must attend for SAAT Counselling schedule on the specified date. The counselling for the candidates qualifying in JEE Main 2017 will be held separately. At the time of SAAT Counselling Procedure applicants must go through a number of subsequent steps choice filling and locking, payment of fee, document verification etc. In regards to more details, go through the below mentioned information. SAAT Counselling 2017 is going to be conducted for various undergraduate and postgraduate admission offered by the University. The eligible candidates will be called for the counselling on the basis of merit list. 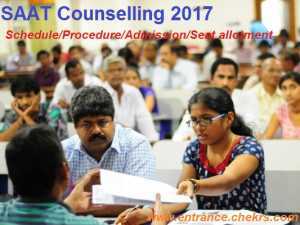 the SAAT counselling process is going to commence in the month of June 2017. Counselling will be carried out at the ITER Campus or on the University campus. Candidates are required to fill their choices of course and lock it as per their preference. During the counselling session, candidates must submit the required documents for verification purpose. Candidates must make a payment of Rs. 30,000 at the time of counselling. The payment must be made through the Demand Draft drawn in the favour of Siksha ‘O’ Anusandhan University payable at Bhubaneswar. For the qualifying candidates of JEE Main 2017 qualifiers, a separate counselling will be conducted by the University. Admit card of SAAT 2017. Score Card of SAAT 2017. 2 sets of attested copies of all the original documents. A draft of Rupees 30,000 drawn from a nationalized bank. 4 recent coloured passport size photographs. All the eligible candidates will be provided their seat through SAAT seat allotment process on the basis of Merit list, candidates choice and as pe r availability. The SAAT Seat allotment Results will be declared after the counselling session and we will also update you here with the same. Here you can also get precise details of Upcoming Engineering UG Admission Exams.